PEARLS feature prominently in the wedding gowns of some of Malaysia’s top celebrities that are now on display at the National Museum. The month-long exhibition is a collaboration between the Rafflesia Pearl Centre and the National Museum with the help of local designers and celebrities. Visitors to the museum can feast their eyes on the splendour of pearls that adorn the wedding gowns of Datuk Siti Nurhaliza, Amber Chia and Ning Baizura. They are on display on the first floor of the main museum building. 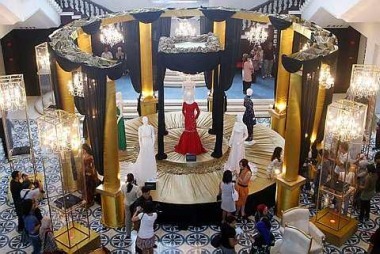 On parade: Six dresses including Siti Nurhaliza’s, Amber Chia’s and Ning Baizura’s wedding costumes are on display on the first floor of Her designer, Keith Kee, said the dress was the main museum building. Part of the exhibition are Rafflesia director Winnie Sin’s anniversary gown and four Diva Gala Ball Gowns together with shoes by Professor Datuk Dr Jimmy Choo’s and his very own pearl brooch. Information, Communication and Culture Ministry secretary-general Datuk Wira Kamaruddin Siaraf said he hoped the event would draw a large crowd to the museum. “Many people enjoy coming during these special exhibitions and we hope the event will spur the interest of the younger generation who are eager to see the gowns up close,” he said at the launch of the exhibition. “With more exhibitions like this, the museum will be able to attract 3.5 million people this year as opposed to only 1.8 million visitors last year,” he added. Celebrity appeal: (from left) Pushpa Narayan, Amber Chia, Ning Baizura, Winnie Sin, Suki Low and Nasha Aziz at the launch of the exhibition. Meanwhile, the managing director of Rafflesia C.L. Sin said the pearl centre was planning a bigger exhibition by enlisting the aid of several local designers. “We are planning on displaying 40 to 50 gowns with pearl details designed by local designers for the next exhibition,” he said. Amber Chia, whose RM380,000 wedding dress is a must-see, said she was proud that her dress was chosen for the exhibition. “I hope visitors to the exhibition will be inspired by it,” she said. Her designer, Keith Kee, said the dress was laced with a total of 999 real pearls signifying love forever in Chinese. “The dress is made from French Silk Chiffon and this is the first gown I have created with pearls,” he said. Puspha Narayan, a pioneer spokesman for Rafflesia, said the pearls from Rafflesia could be trusted. “You know you are buying original pearls when you are at Rafflesia. The designs are also flawless and unique,” she said. The exhibition is on from 9am to 6pm daily till May 16.